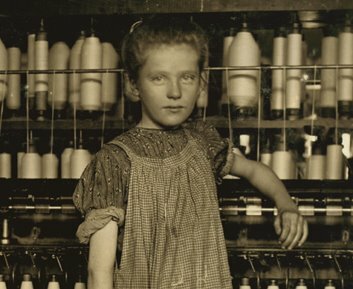 If you are into American history at all, you know the photograph: a weary young girl standing in front of rows of bobbins, a smock askew, hair pulled up, leaning on one elbow, a child pausing from her twelve hour workday. This moment captured in black and white by artist, social reformer and advocate Lewis Hine was the inspiration for Elizabeth Winthrop's latest historical novel. There are so many strong points about this novel. One is the tension. We care about all the characters, and every one of their choices reverberates in the lives of those they love. It is a powerful thing to read, as a child, the impact of decisions upon others in ways we don't expect. The situations, though painful, are done realistically, and convey the conflict of child labor so very powerfully in the context of the character's place and time. Which brings us to the research, which lends both believability and flavor to the prose and does just what good historical fiction should do: carry us away, make us feel as if we are there. The inclusion of Lewis Hine as a character in the story will lead children to delve deeper, in books like KIDS AT WORK: LEWIS HINE AND THE HISTORY OF CHILD LABOR by Russell Freedman (Clarion), KIDS ON STRIKE! by Susan Campbell Bartoletti (Houghton Mifflin), and the wonderful picture book KID BLINK BEATS THE WORLD by Don Brown (Roaring Brook). And the last great feat of this book is voice, which she has given to this Vermont farmgirl faced with the need to do the right thing in the face of contradictions. If you enjoyed the bold candor of the period writing in Jennifer Holm's OUR ONLY MAY AMELIA, you will love Grace's genial, colloquial point of view as well. Book-A-Day will be back Tuesday, October 1st! Have a good weekend. More martial arts translate into the literary arts! Give reluctant reading a karate chop with these black-belt books. Carolyn Crimi is one of my all time favorite authors of humorous books (and one of my favorite live presenters as well), and she, along with other children's book comics Andrea Beaty and Julia Durango have newly constructed my favorite laugh shack in the blogosphere: Three Silly Chicks. All silliness aside, it is an amazing, regularly updated resource for finding humorous children's books, and who could ever have enough of those? This week, they are hosting an easy-to-enter contest you won't want to miss! Don't be chicken, cross that road and check it out! More difficult neighbors! You can hold a storytime at your next condo association meeting. Ummm, hi, Viking, why are these book out of print? Do we have too many books about conflict resolution out there? Am I going to have to come down and get tough?! Just kidding. Luckily, I read these books before they went under, so I know how to play nice with others. Anyway, these are worth a trip to the library. In honor of Johnny "Appleseed" Chapman's birthday, I am going to direct you to my Johnny Appleseed Anniversary page, http://www.planetesme.com/seasons.html#johnny. Pictured is one of my staple storytime stars on this day, an oldie but a goodie: THE STORY OF JOHNNY APPLESEED by Aliki. Johnny Appleseed is my American hero. I talk about him all year long. His birthday is a very holy day on my calendar, because he was a remarkable and singular man, a visionary and an inspiration. Though the details of his life are sometimes mixed with legend, there is one thing I feel in true: every day, he planted at least one seed, and by doing one small thing every day consistently, he changed the landscape of our nation. I believe that read-aloud is one small "seed" we can plant, and by sharing a book with a child every day, we, too, can change the landscape of our nation. I hope we can all pause for just a moment on this special day and think of what we can commit to doing consistently, in his memory and in the interest of our wonderful country. Every year, my family makes a resolution of one small thing we can do every day. You are invited to join in this tradition! What can we do? Read aloud? Recycle something? Do some small kind act anonymously? Feed someone? The saying goes, "Anyone can count the seeds in an apple. Who can count the apples in a seed?" Plant your seed and watch what grows and grows and grows. One of my friends, in a moment of faltered patience with my long-winded adoration, nicknamed me "Jappy Appleseed." I wear that moniker with pride (even if I don't drink Tab or have a credit card, Sheila!). A LITTLE BIT OF WINTERby Paul Stewart and Chris Riddell (HarperCollins) A rabbit is asked by a hibernating hedgehog to preserve for him a little bit of the season. The profound characterization of the animals in this book evokes a comparison to the great Warner Brothers animator Chuck Jones; just as funny and expressive. BLUE BURT AND WIGGLES by Derek Anderson (Simon and Schuster) Two friends try to stop summer fun from fading by using colorful art supplies to disguise autumn's approach. Advance review copies of VIVE LA PARIS are now officially all gone, so I cannot honor any further requests. To those who participated, your books are en route, and thank you for your enthusiasm and also your willingness to get the word out about this book, it is very important to me. I wanted to write a book that would introduce children of all colors and creeds to some of the background knowledge of WWII in a way that preserves optimism and hope. You'll let me know if I managed! I am so excited for you to meet Paris, her family of four brothers, her worst enemy Tanaeja, and her unexpected ally, Mrs. Rosen. Of course, our friends Sahara, Darrell and Miss Pointy that some may remember from SAHARA SPECIAL are back as well! Even if you did not get an advance review copy, you will still have an opportunity to don your rose-colored glasses...it is now available in bookstores! Hooray!!! A middle school teacher recently asked me if there was something he could read to a class he might only have for about twenty minutes once a week. What perfect timing for such a question...here's a book that's solid platinum for anyone with not a lot of time but with a true booklover's heart! Great short story collections for children are few and far between, but just released is a title that's like a box of the most delicious chocolates, two layer's worth, so you just wont be able to help yourself from sitting back like a reclining maja and squishing each and every delicious one. The collection is just brilliant, pulse-perfect and page-turning, from Louis Untemeyer's "Dog of Pompeii" about a pet who gives his all to save a blind boy during a volcanic eruption, the opening story "Rogue Wave" by Theodore Taylor which will leave readers as breathless as if they were watching any movie on the big screen, the time-travel brain-boggler "Lafff" by Lensey Nokoma, and ghostly stories to tickle both your funny bone and skeleton bone such as Andrew Benedict's "To Starch a Spook" or "The Caller" by Robert D. San Souci, in which a spoiled girl gets her come-uppance from the great beyond (who doesn't love a story like that?). I will not even describe the story by Megan Whalen Turner called "The Baby in the Night Deposit Box" because with a title like that, don't you want to read it and find out for yourself? You and your class or your family will not! Be able! To resist! So much for a day of rest! I'll bet your t0-do list is at least as long. Oh, the pain of this modern condition! That is why Peter Reynold's latest book is a special gift to all overscheduled children and grown-up listmakers gone awry. Leo is a busy lad, and "no matter how hard he worked, there was always more to do." So he does what anyone in his situation would: he wishes for a clone. Two is better than one, but what if there were three? Or four? Five Leos could get the job done...and eight work furiously (who knew eight Leos would be eight times the work?). The spread of nine Leos trying to write, play soccer, make phone calls, practice music, take care of pets, clean up and go shopping is a hoot (albiet a painfully familiar hoot). Exhausted, Leo finally falls asleep, and awakens to a chiding: "Dreaming was NOT on the list!" But what would happen if Leo held on to his dream? "What if I did less--- but I did my best?" Here's a book for a happy Monday! I will be appearing at The Bookstall in Winnetka, Illinois on Saturday, 9/16, around 11:30, as part of their teacher inservice (great booktalks given by the staff, too!). Come by if you are able! Alert! If you requested a review copy of VIVE LA PARIS per the offer earlier this week, and you did not e-mail your mailing address to esme-at-ripco-dot-com (hint: I have to write it out like this so I don't get spammed, so use @ for at and . for dot), then you won't end up getting a copy. Sorry, but I can't send a book to your e-mail! Thanks! This is the very last week to get a review copy...after this, you'll have to go to the bookstore! So get 'em while they're hot, and please, tell your listservs, librarians and book clubs! Thanks for the blog, it is awesome! 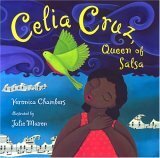 Do you think you could profile some Hispanic/Latino biography type books? These seem VERY difficult to find. One of the few people I have had luck finding is Cesar Chavez. I would like to get a wider variety. 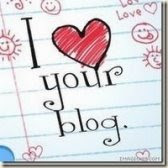 Thanks for your blog. It's the first thing I check on the computer each morning! by Kathleen Krull, illustrated by Yuyi Morales (Harcourt). On a ranch in the Arizona desert was a family thriving on eighty acres, until the great drought drove them all to migrant work. Though their crops may have withered, a seed was germinating in young Cesar Chavez. The indignities he experienced as a shy Spanish-speaking student and the grueling conditions are honestly portayed. Children will be stirred by these indignities, and their hearts equally swelled by the huelga, Chavez's peaceful movement against threatening overlords. His three-hundred mile march from Delano to Sacramento was the longest in U.S. history, and resulted in the first ever contract for farmworkers. This is an extremely powerful book that underscores the bravery and resolve it takes to engage in non-violent protest, and rightly puts Chavez on the same scaffolding as Martin Luther King as a champion of civil rights. The lush illustrations roll across double-pages horizontally set, thoughtfully designed as to emphasize distance: how far the people had to travel both spiritually and physically to achieve the goal. A page-turning read-aloud about an important chapter of Latino history, this is a welcome and well done contribution to the shelves of children's biography. Viva la Causa! If you have an "ASK ESME" question, please e-mail it for consideration to esmeatripcodotcom. Dizzy Gillespie started out as a roughneck, lashing ut after the outrageous slings and arrows that his father delivered. "Then one day, his music teacher gave himn a trumpet. he picked it up/and blew that thing as hard as he could. That felt GOOD! He took all the anger he felt inside and blasted it out through the end of his horn. IT WAS REALLY LOUD!" What started out as musical retaliation becomes a joyful noise, as young Dizzy practices his way down the path of a young musician, making notes that soared like birds, blew like a fire extinguisher over a fire, notes so high, so fast, so low, diddly diddly bop...brick by brick, creating a house of bebop, and a nation of appreciative listeners. 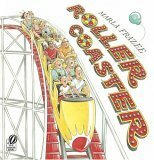 ROLLER COASTER (Harcourt), of particular illustrative power, deftly following the highs and lows of everyone riding on a rollicking route. On a personal note, Marla, are you out there? You're a genius. Can we do a book together? I heart you. XOXO. I know prayer is not part of the secular circles in which I generally work, but Hallelujah! Whenever the start of school rolls around, I have to give thanks to a higher power. What a great gift to be a teacher in America. What a great gift to be able to freely teach girls and women. What a great gift to be able to work in racially integrated classrooms. What a blessing to raise a child at a time and place in which this is taken for granted. Though we still have so far to go towards fully realizing the end of "separate but equal," especially in terms of intergrating our schools by socioeconomic class, children's literature is a powerful source of hope; remember, a great book is the same in the hands of an economically poor child as it is in the hands of a wealthy child, and every time you read aloud or promote literacy, you are working towards equalizing eduaction in America. Inspired by the leadership of Booker T. Washington, Julius Rosenwald, the president of Sears, Roebuck and Company donated millions of dollars as matching grants to build schools in the rural, reconstructionist South. Based on this true unfolding of events, here is a rendering of an honest-to-goodness "school raising" from the point of view of a girl from a sharecropping family ("this school is the first new thing I ever had to call my own"). From the new school rally at the church to the box party (great fundraising concept!) to the cutting of the lumber ("those trees about to make history"), the excitement is palpable, just look at the illustration of those smiling faces of the whole community as the blueprints are laid out! More than history, more than lovely, thoughtful prose, this is a poignant book that will remind children of all races what a wonderful gift it is to be able to go to school. Hope everyone had a lovely Labor Day, sans too much labor! Before we dive back into a continuation of our back-to-school celebration, I have an important announcement for teachers, librarians, bloggers and book groups! A very limited supply of VIVE LA PARIS advance readers copies are left for people who want to share and/or review (i.e. with your local independent bookseller, on Amazon, on your blog, in a classroom or library booktalk) before publication next month! VIVE LA PARIS is the companion novel to SAHARA SPECIAL, and is appropriate for ages 10 and up. Send your request to esmeatripcodotcom, subject heading "Vive la review copy"! Please feel free to share this offer with appropriate listservs and friends. Also, if you signed on for the VIVE LA PARIS round robin earlier this summer and for some reason never got your copy, now's the time to let me know! While supplies last. And many, many thanks for those of you who have been so kind in helping me get the word out so far. This book is very important to me and I want it to find its audience.